Q & A Friday- I’ve Stopped Binge Eating but I Haven’t Lost Weight- Help! Today’s question comes to us from Pamela in New Jersey. This is a super common and difficult question that comes quite often in ED recovery. I have an ED therapist and ED nutritionist and I’ve been seeing them for over a year. I’m also in a weekly ED recovery group. I think I’m doing good with recovery but I’m not losing weight. I think it’s because I’m still eating to take the edge off. Not in a binge sort of way but in a starting point sort of way. I’ve been paying more attention to using the hunger scale recently and that’s improving. Not losing anything since starting a serious recovery program is very discouraging. I’m no small fry, I’m over 300 pounds. I have very low energy and still sleep quite a bit which makes sense considering my body is very large. Everyone in recovery says it’s not about the weight. It’s about healing the behaviors and the weight I suppose will come off eventually. I’ve found a lot of peace but it’s not easy being so large. When I bring up weight loss to my ED nutritionist she say’s that should be on the back burner for now. However even after all the progress and peace I am discouraged and down mood wise. My poor body has endured much with the BED. I’m getting up there in years now (55yo) and it’s not getting easier carrying the extra weight. I understand the goal isn’t to “lose” weight but to find more normalized behaviors around food and resolve the need for emotional eating. But i am tired, I am feeling low and today I’m discouraged. I’ve done a good job not making about the weight over almost the past two years and weight wise I’ve let go of 10 pounds or so. When do I let it go of the big excess weight. I know you cant tell me but there must be a way to combine releasing extra weight with recovery even if it is some form of a “diet”. There has got to be a way to gain physical health and normalized eating together. I have no illusion of being super small, I think I have a very real thought of what my body is comfortable size/weight wise. But when I bring it up I am told that losing weight cant be the focus. But that doesn’t change that it’s just to hard and humiliating carrying this extra 150 pounds. Yes Humiliating at times when I cant sit at a table at a restaurant for example, or cant sit on someone’s couch bc it wont hold me. I’m in pain emotionally and physically over this weight issue and I need someone with some direction other than put it on the back burner. I’m asking you bc whenever I read what you have to say you make sense. Your question is such a good one. As long as I have been working in Eating Disorder Recovery, this conundrum has come up on an almost daily basis. People either start to gain weight in their recovery and it’s very upsetting for them, or they find that they have been not bingeing, not purging, no restricting, and not dieting — but they have not lost any weight. They then become extremely discouraged and also very angry. The anger is usually directed at recovery or at their recovery team. They wonder why they’ve wasted all this time not on a diet when they could have been on a diet and lost weight rather than what they’re doing right now. My friend Sheira, who is a well known eating disorder therapist often says, “when you focus on weight loss, you make a pact with the devil.” As an Eating Disorder Therapist, when you promise anyone that you will help them lose weight or you focus on weight loss with them, you begin corroborating with the societal message that got them into their Eating Disorder to begin with. The very first thing we need to do with someone who is recovering from an eating disorder is to help them take their focus off of food and weight and the scale and diets and weight loss and help them to refocus on their mental and physical health. Dieting and the pursuit of weight loss does not equal health. The problem is that we have been told that it does– not only does weight loss equal health, it also equals beauty and it equals our worth in the world. I remember an interview many, many years back with Duff (she was one of the first MTV Vee-Jays). She was a model and model thin– and then she became ill. While going through multiple chemotherapy treatments she became really skinny, sick skinny– and people started complimenting her on her weight loss and saying things like, “whatever you’re doing- keep it up! You look great!” She was appalled. She was already super thin and then she was sick. Skinny culture is not about health. This is why we don’t focus on weight loss in ED recovery. We focus on health. And sometimes health means weight gain while focusing on mental health recovery. This is a super common argument that occurs when the Eating Disorder Community gets into a room with the Obesity Awareness community. When we go to Eating Disorders conferences, there are always inevitably lots of folks from the Obesity recovery community. The obesity researchers look at weight loss while the ED recovery community feels that the goal of weight loss most often ends in an eating disorder for the ED population, so treat the eating disorder and weight will come to its natural place. The belief is that concentrating on weight loss will bring you back to a place of obsessing on the scale, feeling like a failure and then reverting to eating disorder ways. In ED recovery, we want to treat your brain first and help you to find a place of peace. We believe that your healthy body will come concurrently with a healthy mind. This argument however does not really fly when people feel that their weight is negatively impacting their lives. People tend to interject society’s negative connotations of their weight with their own feelings about how wrong they are and feel in the world. The answer is to address the problem that you’re dealing with, not the weight. For instance– pre-diabetes. The recommendations for reversing pre-diabetes includes eating healthy food and exercising 30 minutes a day. Exercise does not have to be pejorative or punishing or painful. It can be a walk with your kiddos around the neighborhood, it can be swimming, it can be a yoga video, it can be jumping on a trampoline. Pre-diabetes is having an elevated blood glucose level and can be helped by exercise because when you utilize your muscles they will pull glucose out of your blood for energy and stamina. And healthy eating doesn’t have to be a diet determined by someone outside of you. Healthy eating includes eating lots of whole unprocessed foods when you’re hungry and stopping when you’re body is satisfied and allowing yourself to eat foods for enjoyment (like ice cream!) in a non-bingeing and loving way. Having no energy is something that you can work on as well. People of all shapes and sizes (especially women) feel that they have no energy. Ways to increase your energy again include getting 7-9 hours of sleep each night, exercising and eating for both health and enjoyment. If you are able to eat when you are hungry, stop when you are satisfied and incorporate loving, healthy movement into your daily routine– your body WILL come to its healthy weight without you focusing on weight loss as the goal. Try to shift your focus instead on personal health and inner peace. When my clients ask about weight loss, we try to look and see what they think weight loss will offer them. Often answers vary from things like: Losing weight will give me: more friends, more confidence, more energy, more love, the ability to go out and do things that I’ve been missing, I can wear whatever I want… The truth is, you can reverse engineer this. Don’t think about losing weight as the antidote to the issues. When you look to treat each issue individually, you wind up finding the benefits that you think weight loss will give you. Chasing the almighty number on the scale– for someone who has been in that rat race for a number of years, will only keep them in it. Chase true health instead. What do you think? Does it makes sense? I hope that this response was helpful for you. 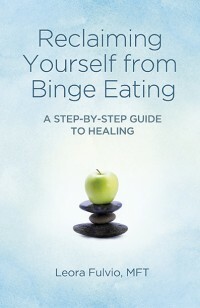 Do you have a question about binge eating, bulimia, anorexia, or anything associated with eating? Send an email to bingeeatingtherapy at gmail dot com. All questions will be kept confidential. Include your first name or the name you want to be referred to as and your location. Are you interested in online therapy or coaching to deal with your eating disorder? Please contact me to discuss getting started. It’s been more than a week since I’ve returned from the International Academy of Eating Disorders annual conference (though returned is really a silly word as it was only 12 miles from my house this year), and I’m finally able to sit down and gather my thoughts about it. If you’ve never been, even if you’re not a clinician, I highly recommend. There is a lot of advocacy and research there and many things to learn. Next year it’s going to be in Prague! I certainly won’t be able to go, but I was psyched to have an opportunity to go this year as it was in San Francisco. With two littles at home, big travel is hard. Eating disorder research and treatment vs. obesity research and treatment. Wow. There was serious, serious controversy there. This is because obesity researchers as well as state funded grants (think NIH) are still using ideas such as food restriction, caloric restriction and BMI to measure recovery. All eating disorder clinicians and researchers have evidence that all of this, dietary restriction, BMI, “weight management” and dieting all lead to disordered eating patterns. Obesity researchers believe that obesity has to be treated because it leads to heart disease, Type II diabetes, etc. But Eating Disorder researchers and clinicians (and me too!) believe that when you focus on the obesity as the health problem, you are doing a disservice to the patient – you should be focusing on health and treating the specific disease. “Treating Obesity” continually leads to failure. Obesity isn’t a disease, but heart disease is. Next off we discussed ADVOCACY a whole lot. People often think of eating disorders as a white woman’s disease, but the truth is that EDs hit not just white women, but women AND MEN across all races. In fact, Latina women have a higher incidence of eating disorders than white women. But most people of color or folks who aren’t cisgender tend to shy away from treatment – for many reasons. It’s not accessible (affordable), it’s not relatable- treatment is geared toward one gender and one race, and it’s stigmatized and unsupported by family and community. For instance, many years ago I had a client who, despite the fact that she had a horrific case of bulimia, her family would not support her treatment because they said it was a “white women’s disease.” She did come in for treatment and got great support from our treatment center and the treatment community but not from her family or her own community. This is not an uncommon situation. The fact that she came in for treatment is really fantastic, but most people don’t. The conference spoke a lot about getting it out there that EDs strike everyone everywhere and nobody should be ashamed to try and get help. And, as a community of ED professionals- we have to provide more help in different and more accessible ways. So lots to do there. And a note, if you are a human being who is not a white woman and you are suffering from an ED- please do reach out (you can even reply to this post) and I’ll point you in the right direction for treatment- thanks to this conference I have some really great resources now. I met some of my heros of Eating Disorders, like Deb Burgard – and I was really seriously starstruck and took a selfie with her- it was more exciting to me than meeting say Johnny Depp (but honestly that would excite me too). If you don’t know about Deb, please click her name above and check out her work. She is a brilliant Psychologist, speaker and advocate for size diversity and Health at Every Size. I also got to meet Lizabeth Wesely-Casella from Bingebehavior.com – (have you read that blog? It’s awesome). And that was really exciting as well. Such amazing people do this work – it’s good work, and it’s hard work. Body Positivity – A lot of people ask me why as a a clinician treating Eating Disorders I advocate for Health at Every Size and why it’s important. 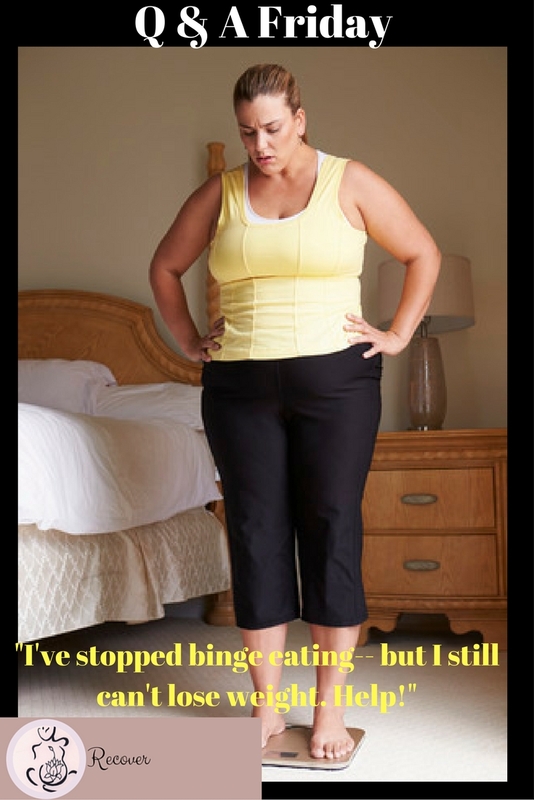 The answer is easy- almost every eating disorder started with a diet. If we can eradicate people being told that they are not good enough and they need to diet, we can deeply change the internalized messages that dieting is the only way out – we then allow people to live in bodies that were meant for them. Those bodies might be big or they might be small- but what we want them to focus on is their true health. True health isn’t about getting on a scale to measure your health. It’s about giving your body what it needs- good healthy food and good healthy movement (where you can), but of course movement and exercise can be difficult for those in larger bodies because of the social stigma. So it’s all very challenging and there needs to be a lot more kindness and acceptance out there. And the obesity paradox actually says that people in the “overweight” BMI category live longer and are healthier. So there you go. There’s no good science around these debates yet. Body Image – The body image part was interesting. I talked to a lot of different experts on it. The consensus is really that body image is deeply ingrained and that we should be working on prevention more than anything else. The body project is a good example of that kind of early intervention. I went to a ton of neuropsych panels that were fascinating, but I’ll metabolize them into a different and accessible post soon enough. Eating disorders are notoriously difficult to both treat and understand, but people are working really hard to make it happen and to find help for those suffering. Fortunately many people have gotten to the other side of their EDs and recovery is possible. If you need help, please reach out, you can reply to this post, email me directly or go directly to NEDA or call 800-931-2237. What “I Feel Fat!” Really Means. So what to do when you “feel fat?” Remind yourself that fat is not a feeling and ask yourself, “what is underneath that? what am I really feeling? Am I feeling afraid of judgment, am I afraid that others will see me and judge me? Do I feel ashamed of myself because I believe that I’m not good enough? That I’ve failed?” Then, I want you to forgive yourself for not accepting that you are in the perfect place in this moment. Everything that you are and that has led you up to this moment is perfect. Give yourself permission to be who you are today. And then you can think about what you are really feeling and help take care of yourself with compassion. How do you take care of yourself with compassion? 1. Pull the word fat out of the equation. Instead of “I feel fat,” ask yourself what you are really feeling. Am I feeling afraid of others judgment? Am I feeling ashamed of myself? Am I feeling angry at myself? Am I feeling afraid that I will be rejected or snubbed or not worthy of love or respect? Am I afraid that I’m not good enough? Am I feeling my own judgment coming up and spilling all over myself? 2. Think about that part of yourself that is feeling ashamed or sad or bad and imagine that it’s your best friend or a child. How would you talk to a little girl or your best friend who was feeling ashamed? Would you tell her that she was fat? Or would you tell her that she was perfect and wonderful and that you loved her? Would you give her a hug and tell her all the amazing things about her? That’s how you should talk to yourself. You are worth it. 3. Implement some good self care stat. Take a bath, a shower, book a manicure, a pedicure or a haircut or facial. Get dressed in clean clothes that make you feel good- and even if you can’t feel good, at least put on clothes that make you feel comfortable. 4. Control things that you can in a healthy way- make your bed, take 15 minutes to tidy up around your house, clean out your car, your wallet or your purse— just help your surroundings feel more organized. There’s this way that when you are feeling fragmented and your brain is getting down on you that organizing your surroundings can help you feel a little more grounded and peaceful. 5. Do the next right thing– rather than thinking big about everything that you have to do, just think of the very next thing to do that will help you feel peaceful. No diets, no beating yourself up, no regrets, just going forward in peace and recovery.